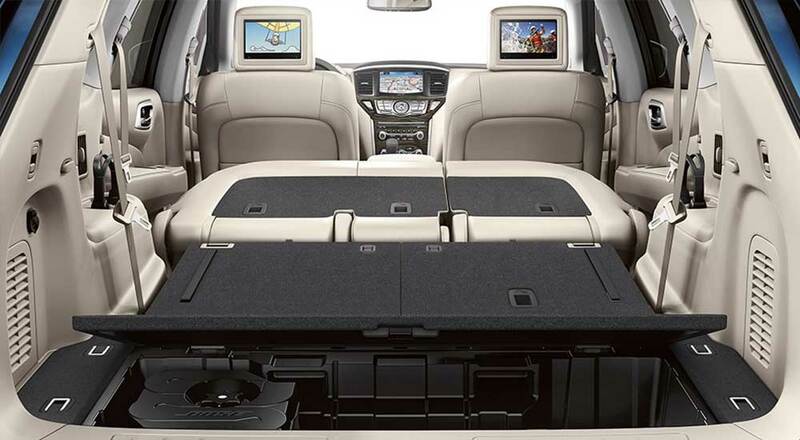 One of the most common questions we get about the Nissan Pathfinder is “How many seats does it offer?” The 2019 Nissan Pathfinder seating capacity is seven. Additionally, it offers up to 78.9 cubic feet of cargo space, so you can transport passengers and their belongings around Tacoma and Bonney Lake. Read on to learn more about the features and space the new Pathfinder offers! Comfort: Standard features include cruise control, tri-zone automatic temperature control system, center console storage, remote keyless entry, and push-button ignition. Cooled/heated front seats and a power-adjustable passenger seat are available. Technologies: Standard features include SiriusXM® satellite radio, six USB ports, and NissanConnect® with an 8-inch display. Options include a 13-speaker sound system and a Nissan Navigation System. Safety: You and your passengers will feel at ease on Federal Way roads, thanks to features like standard automatic emergency braking, rear cross-traffic alert, and an optional blind spot monitor. Test Drive a New Pathfinder at Bill Korum's Puyallup Nissan in Puyallup! Schedule a test drive at Bill Korum's Puyallup Nissan to explore the Nissan Pathfinder 3rd row seating, performance, towing capacity, and more. We’re conveniently located near Spanaway and Lakewood. If you have questions about the new Pathfinder, or our new vehicle specials, contact us today!